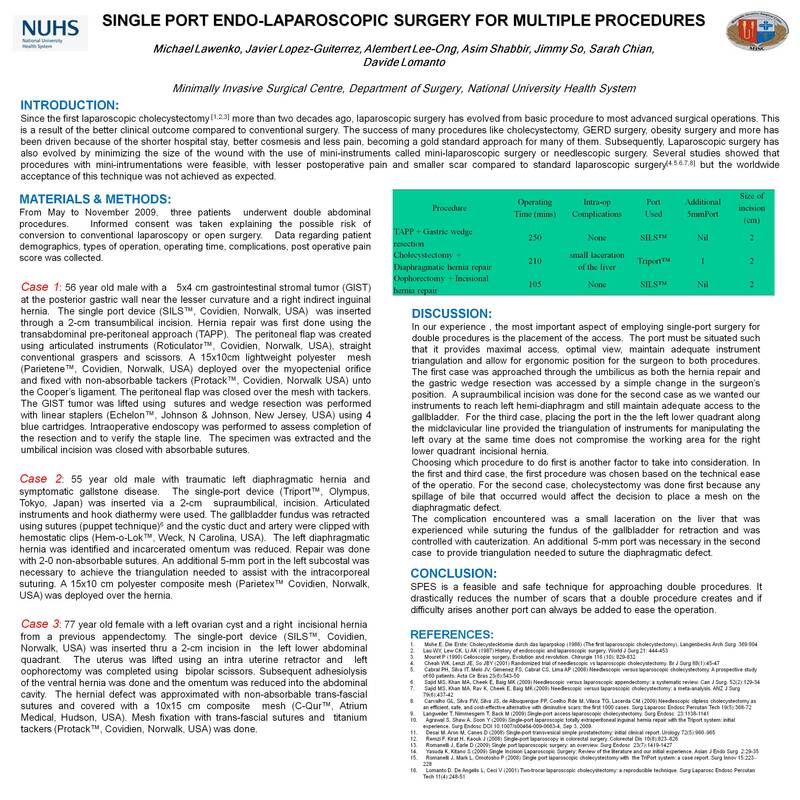 Single port endo-laparoscopic surgery (SPES) is gaining enthusiasm in the surgical community due to its perceived better outcome of pain and cosmesis. The advantages are further extrapolated by achieving multiple operations with a single incision. The feasibility and safety of SPES in double procedures is assessed. Case 1: A 56 year old male with a 5×4 cm posterior gastric wall GIST near the lesser curvature and a right indirect inguinal hernia. The SILS™ port (Coviden, USA) was inserted through a 2.5cm vertical umbilical incision. Trans-abdominal preperitoneal (TAPP) repair was performed with a flat polypropelene mesh and fixation with absorbable tackers. The gastric wedge resection followed, gastric retraction was achieved by lifting the anterior gastric wall with a suture. Linear staplers with blue cartridges (x3) was used for the wedge resection. Case 2: A 55 year old male with acquired chronic left diaphragmatic hernia and symptomatic gallstone disease. The LESS™ device (Olympus, Japan) was inserted via a 2.5cm infraumbilical transverse incision. Retraction of the gallbladder was achieved by non- absorbable sutures using the puppet technique. Retrograde cholecystectomy was achieved. Non-absorbable suture closure of the 4 cm diaphragmatic defect was done. An additional 5mm port in the left subcostal area was needed to assist in suturing. Titanium tackers were used to anchor the 15×10 cm overlayed composite mesh. Operating time was 250 and 210 minutes respectively. Incision length intraoperatively was 2.5 cm and 3 cm while post-operatively was 3 cm and 3.5 cm respectively. Post operative stay was 47 and 72 hours respectively. Intraoperative complication of a laceration of the Glisson’s capsule due to the suturing of the gallbladder fundus was noted in the second case. SPES is a feasible and safe technique for approaching double procedures. It drastically reduces the number of scars that a double procedure creates. If difficulty arises another port can always be added to add ease to the operation.